Triathlon Life! : Ran like a god! Today I ran the Hermes Cleveland 10 miler race. The theme of the race is "run like a god". Hermes, the winged-footed messenger god of classical mythology was the Son of Zeus and Maia, daughter of the Titan Atlas. He wore wings on his sandals as a sign of his swiftness. 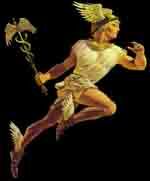 Hermes was a young athletic man and is credited for inventing foot racing and boxing. I felt like the "wings of hermes" were on my shoes today! Weather conditions I thought was near perfect with tempertures around 56 degrees with some light breeze blowing off Lake Erie. Speaking of eerie we ran a good portion of the race in a fog! Visiblity at times was less than 100 meters. It was a good thing I knew the course because I would loose sight of the lead runners in the fog. I was able to maintain a steady even pace. Water and Gatorade were at the 2, 4, 6, & 8 mile markers. I made sure to drink one good sip of water at each water stop. The "wings" brought me to the finish line in 6th place overall with a time of 1:01:10. Follow link to see results. The kids race had about 20 kids ages 10 and under. 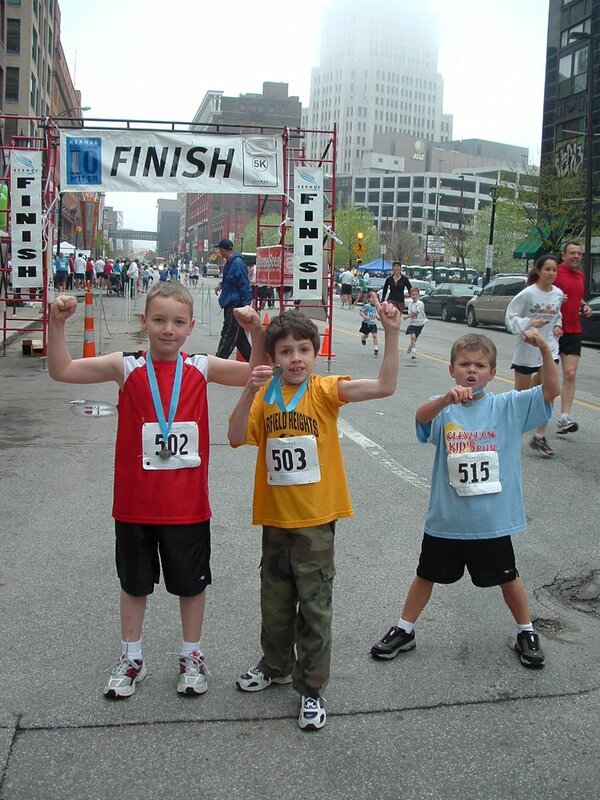 My son, grandson, and their friend toed the starting line. They ran about 200 meters out to a turnaround cone and headed back to the starting line. I gave them a race strategy of starting out easy and to let the kids run fast at the start but that the race would begin after the turnaround. The strategy worked! My son was the overall winner followed by my grandson in 2nd place and their friend took 4th place. Looks like a great time! Good time and 7th overall...ain't bad! Those little wild men with all that energy;) Our children really are our crowns. Lucky guy you are!! Can't wait until I get to enter my child into a kids race. Those are so much fun! What a great race!! 1:01! Amazing! And love that the kids ran their own race - good for them! Oh that picture is sooo cute! Congrats to both you and your son, grandson and friend! Awesome race!!! I definitely need to hit the track with you. I'll bet in ten years those kids will be passing me in the last mile of a 10k race somewhere. Good race and it sounds like great coaching! You did great, what a good race! Lovely to see how children enjoy running as you!!! I sense a Papa Louie dynasty beginning. I yelled out your blog name as you passed me going the other direction after the turnaround - probably around mile 8 for you. Nice Run!